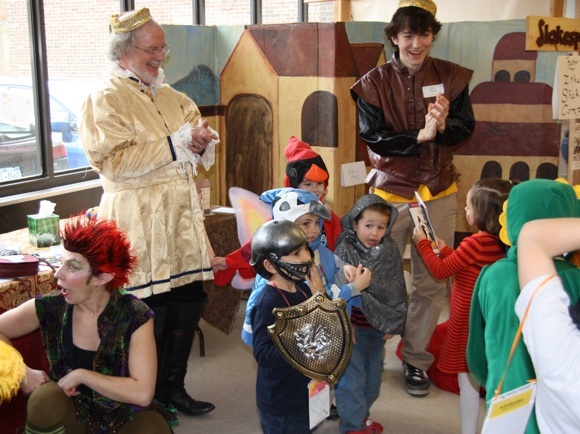 Each November, the Ithaca Shakespeare Company sets up "Shakespeare Lane" at the Family Reading Partnership's annual Kids' Book Fest. This event is part of the FRP's mission to help children experience the pleasure of books as part of everyday family life, right from the start. Parents and children visiting Shakespeare Lane can put on costumes, read adapted versions of Shakespeare's plays and books about his life, play with a miniature Globe Theatre, compose poems out of Shakespearean words, and generally have a great time bringing Shakespeare's works to life. Click the thumbnails below to see more shots of the merry chaos and happy young Shakespeareans at Book Fest.